[Ottawa – October 15, 2015] As we sit less than four days out from Election Day, there is precious little to report. While we thought at the beginning of the week that the race would be clarified by now, it isn’t. The gap between the Liberals and the Conservatives has narrowed slightly and the Liberals’ advantage is no longer statistically significant. 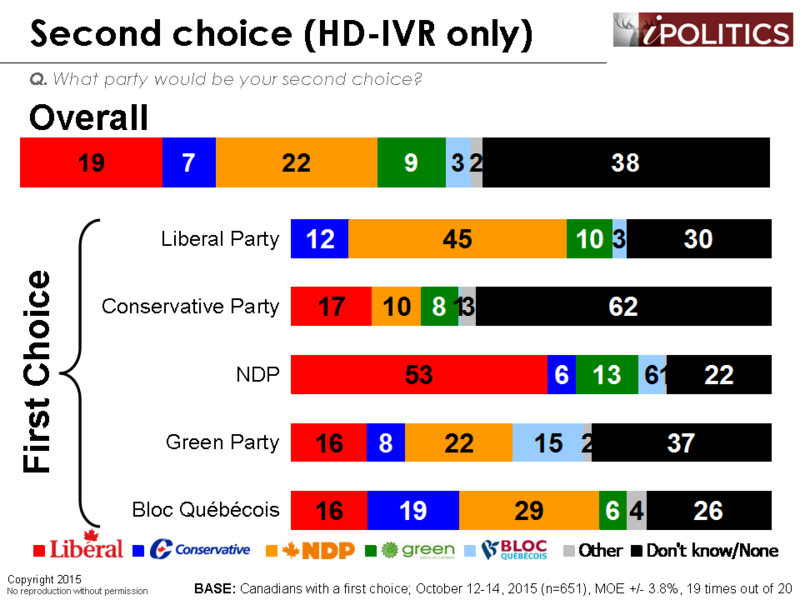 The NDP remains in third place, although they are still a major player in this election. Regionally, Ontario continues to look very positive for the Liberals, while Quebec is looking very positive for the NDP. British Columbia, meanwhile, is a tight race with all three parties vying for the lead. The Liberals continue to dominate Atlantic Canada, while Alberta remains firmly in the hands of the Conservatives. The Conservatives still lead with seniors, although their advantage here has been weakened over the past week (the Hazel McCallion effect?). The figures in this report are based on a three-day rolling sample. Each day, a new day’s worth of interviewing is added and the oldest day is dropped. The field dates for this survey are October 12-14, 2015. In total, a random sample of 1,438 Canadian adults aged 18 and over responded to the survey (1,154 by HD-IVR, 284 by live interviewer). The margin of error associated with the total sample is +/- 2.6 percentage points, 19 times out of 20. *Note that due to the Thanksgiving holiday, we did not run the live interviewer portion on Monday, October 12th. I am staying with the NDP until the very end. Trudeau is basically the same thing as Harper, especially after it came to light that his manager was in bed with big oil. As for the strategic voting, nobody will tell me how to vote. I am a woman who knows her mind, and there is not a chance that I will compromise my principles and vote for a leader who also supports Bill C-51, oil companies, TPP and Keyston XL Pipeline (Justin Trudeau). The media is no longer giving Tom any airtime, they are clearly in support of Trudeau. Vote NDP for real change. Principles are good but Trudeau is not even close to Harper and your NDP vote only helps Harper. We can take this election away from Harper but only if enough progressives will vote for Trudeau. Trudeau cares about changing C51, the environment, democratic rights and he will be an enormous improvement over Harper. This depends where you live. If you live in BC outside the Lower Mainland, or in Saskatchewan, for two examples, the strategic vote is NDP. Leadnow has good information on this. Leadnow has no credibility after they have been caught in a conflict of interest. Leadnow has been falsely accused of bias in favor of the NDP, based on a contoversial call by their members in one riding. Overall, they have endorsed 13 Liberals and 10 NDP, so the charge is dubious. Yeah, I would never vote for the NDP but I think ‘strategic voting’ is very cowardly and lacks commitment and ideals. Good on you for following what you believe in. Conservatives do of course hate strategic voting. I’m a strategic voter. My principle is that Mr Harper has done great damage to Canada and I want a different government. The other parties are not that much different from each other, so I will go with my own commitment and ideals and vote strategically. I would then like to see electoral reform, so that this is the last time I will have to think about strategic voting. But don’t make the mistake of thinking we strategic voters don’t have strong commitment and ideals, just because those ideals are not yours. Here are some Canadians with real commitment and ideals, folks. i’m not sure this is the right place for this, but if you’re voting against oil you might want to consider voting or the greens. the unions are very invested in the east-west pipeline. and the ndp platform is built around the idea of taxing oil to pay for services. i wish the liberals were a bit less gung-ho on the oil patch. but, they seem to have their head around the idea of transition a little bit better. the ndp aren’t talking about putting billions down on transition infrastructure. in the end, we’re going to be talking in theoreticals because only one party can govern. but the reality is that neither party is going to bite the oil industry. and, in that context, i’d rather put my vote towards building infrastructure that can replace the carbon economy, and then worry about shutting down the export market once we have that in place. but, we’re going to have to fight the pipelines in court. all three parties support one pipeline or the other. it’s just that you don’t tax oil to pay for services if you’re serious about reducing carbon. that puts you in a fiscal position where you’re reliant on oil revenue. which is the situation we’re in now. it’s just this huge contradiction. and, if you watched the debates, the argument from both the liberals and ndp is that the conservatives weren’t building the pipeline fast enough – and how they would both do more to build the pipelines faster. it’s cynical, but it may be the case that an environmentalist might want to vote conservative, because at least we can count on them mismanaging the whole thing to point that nothing gets accomplished. there’s not a good option here. there’s the greens. but, i mean, look at where they’re polling. and, it’s kind of the same thing with the tpp. at least we all expect the liberals to support the tpp – they support most trade agreements. but, then we had the ndp initially come out in support of it, and then flip on it in ways that allow them to flip back. i mean, they’re arguing about supply management. the supply management part really doesn’t seem that bad. i wouldn’t expect mulcair to reject the deal on a 3% market access to dairy products, and i think he’s asking a lot of people to believe him on that point. there was a time when the ndp would argue against the chapter 11 style clauses – the investor rights agreements. that was the basis of opposition to it for decades. but, you won’t hear mulcair criticize this. and, the sum of it makes me skeptical about whether he’s actually opposed to it. i would expect the ndp to support the tpp. i see every reason to think the greens are legitimately opposed to it. but, again – look at the polls. it’s something that seems like it should be an issue, but the ndp is not taking the positions you would expect them to take. and it’s maybe not such a good idea to vote for them on phantom projections that they’re not actually articulating. and, this is the problem they’ve created with so many people on the left. i’m to the left of both the liberals and the ndp. i’m to the left of the greens, even. but, in an attempt to park themselves in the centre, they’ve negated all the reasons i may have seen them as preferable to the liberals. nor have the liberals really steered that far away from where they normally are; there’s nothing in their platform that i wouldn’t have expected from a dion or even a martin government. but, in comparison, it just seems a lot more progressive in comparison – without really being particularly progressive. people are going to look back at what mulcair has done here as a textbook case of what not to do. but, it’s ironic. because he’s following what people would claim is conventional wisdom – position yourself in the centre. what we’re learning is that the centre isn’t where the pundits have placed it. it’s somewhere well to the left. i do hope the ndp right themselves. but, they’re going to need a change of leadership that is willing to abide by their own conventions before i’m willing to again take them seriously as a more progressive alternative to the liberals. the truth is trudeau’s got a gift here. and i hope he doesn’t blow the opportunity. But, you are voting for a party with little chance of forming government. For me, step 1 to changing things in Canada is getting rid if Harper. I’ll worry about step 2 later. As if today, in my riding (Nepeqn) voting Liberal is the most I can do to get rid of Harper. EKOS has to be the most inconsistent pollster so far this campaign (or maybe tied with Mainstreet). Everybody follows the same trend meaning the gap increases, but EKOS goes with those wild fluctuations. I’m starting to wonder if the IVR method is garbage. All the IVR pollsters have those wild fluctuations throughout the campaign, while the online and telephone pollsters have been more consistent especially Ipsos, Nanos and Leger. Well, I guess the only way to find out is to see what happens on the 19th… I hope that the IVR isn’t garbage, but we will see. what i’ve noticed is that the only thing that seriously correlates with the conservatives is the undecideds. when undecideds go up, the sample size decreases and the conservatives go up. when the undecideds go down, the sample size increases and the conservatives go down. what that means is that a lot of the fluctuations you’re seeing in a lot of the results is misleading – the conservatives have been pretty much flat at 30 (+/- a reasonable error) for months, whereas undecideds have been wavering all over the place between the ndp and the liberals, and increasingly choosing the liberals the last few weeks. when you see that conservatives at 35 over ivr, what that almost always really means is they’re around 30 amongst decideds, but the undecideds are at like 15 or something. i do think that the ivr has something to do with that, in the sense that i think it’s more accurate at determining undecideds (because you don’t have agents pushing for an answer), but less clear about soft votes. so, you get this different kind of measurement. you’re not really seeing much of a difference here with nanos, outside the margins. and, a 33-33 national tie really isn’t a close race, if the liberals are at 45% in ontario. but, i think it’s the answer to the volatility. and, while that may seem to be even less consistent, what it’s suggesting is simply something we already know: the conservatives are basically flat at 30, and the swing on the left is pretty weak in terms of party loyalty. of course, keeping in mind caveats about small sample sizes, large regional margins and the volatility of daily polling due to it. it may seem weird that i’m not doing that with the phones, but what i’m saying is that what this method seems to do is really understand real undecideds as a distinct category, rather than as something to distribute proportional to the decideds, the way that phones tend to. it’s the difference between an agent prodding and not. although, ekos doesn’t have the high undecideds the way mainstreet does (although i still don’t know what “invalid response” means, and the two sum roughly to what mainstreet gets in the undecideds.). maybe it’s the blended sample, i don’t know. i just know it’s the only thing that really seems correlated with conservative numbers. I believe the EKOS poll is actually the correct one. At the provincial election in Ontario 2014, the EKOS estimation was the closest. The early voters usually vote with the incumbent, they don’t go with the challenger. And this year we had almost 4 million0 early voters. Undecided voters again, usually, vote with the incumbent. I suspect EKOS factored somehow these situations and that’s why now, the conservatives are up. I would factor even a boomerang effect. When people are asked to vote “strategically” to defeat the conservatives, some of them will do exact the opposite. More, these last days Trudeau did the mistake to personally attack Harper, pointing out that he is the number 1 enemy of Canada. Again a thumb down. Harper was very popular a few years ago. Those who remember that will “avenge” Harper. It’s no surprise if the conservatives win. It’s normal! It’s always possible you will turn out to be right, but there may well be other factors in the higher turnout. Just as excitement over Obama raised the turnout in 2008, people worried and or angry at the prospect of four more years of Harper may be voting in larger numbers than in 2011. We won’t really know till Monday night, or maybe Tuesday. But Ekos was very far off the pace in 2011. Nanos and Forum were actually closest. This year they have the Liberals ahead by 6. I would also point out that Harper campaigning with the Ford clowns is also a big mistake. And, when did Trudeau call Harper the #1 enemy of Canada’s? I’m not saying he didn’t, but where was this reported? So Happy to say again the Conservative and Sir Stefen Harper in Ottawa, i am from Québec, I and my wife will vote for Harper, for me is the only one who say the truth. I’m no statistician, but I noticed that the numbers of the cons also fluctuate drastically with their ranking among the 18-34 votes. When they’re up in that group, they’re up overall. And vice versa. They are pretty stable otherwise. Are the 18-34 more volatile swing voters? Or does the small sample size throw things off? I’d be interested to know the answer. i’ve never worked as a statistician, but i have enough math credits for at least a master’s degree (not really in stats, more in abstract algebra, computer math and theoretical calculus). i would suggest that what you need to do is look at a longterm graph – you’re going to see fluctuations day-to-day, due to small sample sizes. blips, if you will. 14% for the Bloc in Québec?! It sure does’nt match with local polsters as they’re ranked near 25% and even 30% among the francophones. Completely and utterly infactual. Considering the Conservatives are projected to have 70 seats; to say the Liberals only marginally lead over the Conservatives is idiotic at best. Hey Ekos, why don’t you try actually combing through each riding and adding up the seat counts. It’ll take you an hour, but you’re going to come to a stark reality on your Conservative biased ways. Look at 2011 EKOS actually UNDERESTIMATED the Tory vote by 6%. Get used to the idea, Harper is here to stay. And they wrote a long article about their error and how they are going to great lengths to correct it. So if anything, they are likely overcompensating this time around. Actually his statement reflected that he wanted as many votes as possible and of course a majority. Who would not want this. Non issue at best. He only said it in French, or that gobble-de-goop they call French Canadian. He was careful to to say it in English. He’s toast. Another Tory scalp. To me the ceiling potential are most intriguing. The Conservatives at 32 with a 38 ceiling seems too close to be accurate. I think it is a mistake, he is just not ready. We need a poll that measures likely voter turnout rather than the current methodology that resembles a popularity contest or who will be elected prom Quinn/king. As prom king justin would win. A job that unlike prime minister he is qualified to do. Mimbo. I like how a federal election brings out the worst in people, I also am a little sad to say that I don’t really like any of the leading Party’s leaders. I thought we could do better. 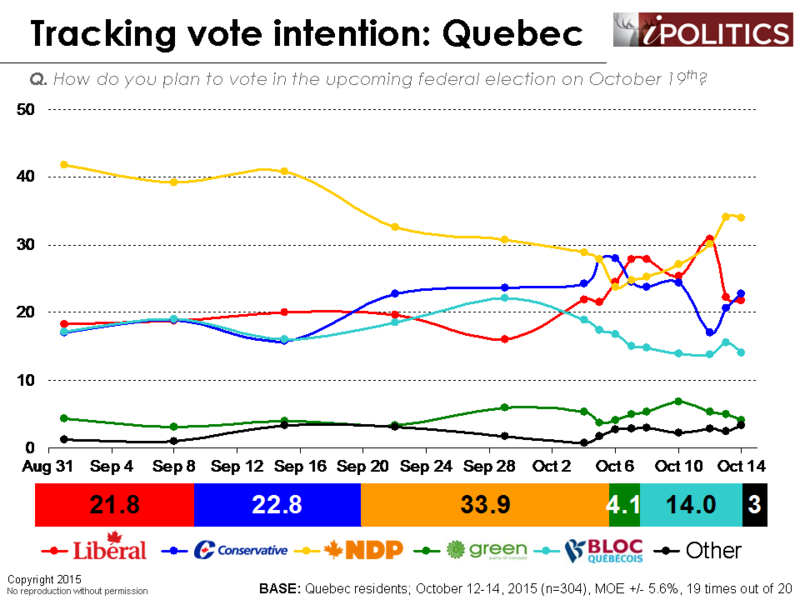 You are the only poll to say that NDP is still leading in Quebec. Everyone expect the Liberals to have as many votes as the NDP. You are the only poll who says that Conservatives would have more votes than the BQ. No one has shown that the Conservatives would have more votes than the Liberals in Quebec. I think you have the things all wrong in Quebec. If you are right, all the others are wrong. Yah the EKOS polls have a lot of movement in them and also numbers that really tend to stand out from the rest of the polling companies (e.g Greens 15-19% in BC vs everyone else having them at about 5-6). 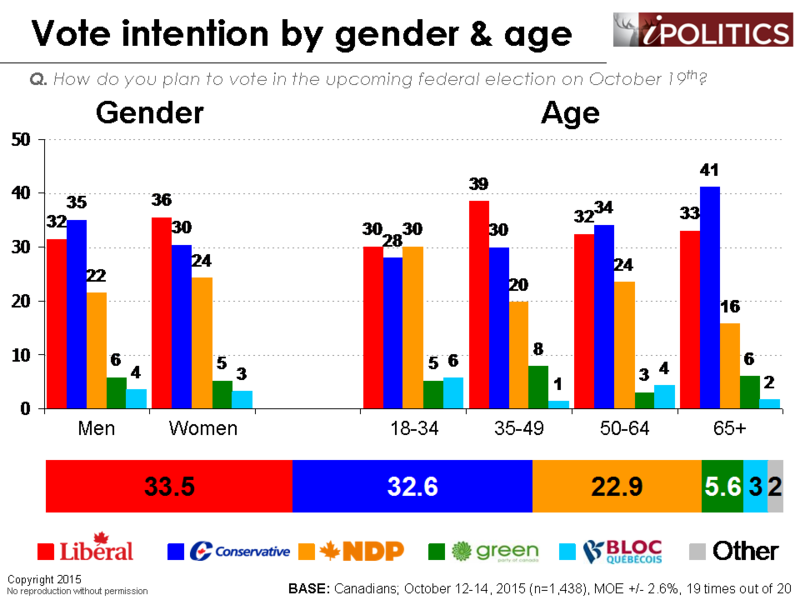 Forum just released a poll showing Libs 37, CPC 31, NDP 24 but perhaps more importantly – consistency. The numbers did not move at all in 7 days (well up one for the NDP). 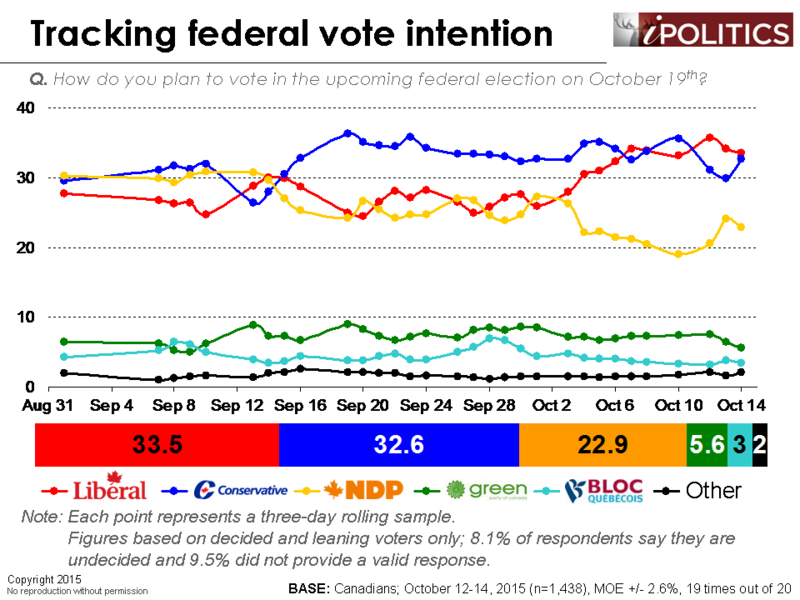 Of course – Oct 19th will be the final say but you wonder why EKOS keeps having outlier polls. The Tory uptick and Liberal downtick could just be a fluke within the margin of error, but Nanos is showing it as well. Not sure what to make of that. Could be something different tomorrow. But if it continues it’s still too little too late. Harper is 10 times the leader Trudeau will ever be. It is sad day in Canadian politics when people think a liberal leader with no credentials is a better choice than Harper. Just because of his last name. Do not be fooled by the word change. Under Harper we have a strong government, a strong country and we are going in the right direction. We need a clear thinker not someone who acts on his emotions. The only message I hear is stop harper and that is pretty sad. Obviously no one has anything better to offer. IF Mulcair and Trudeau will not work with Harper then they should not be in politics. It will be the same as Obama not being able to work with the Republicans. We all saw how that played out. There is only one choice this monday and it is Steven Harper. WELL SAID AND TOTALLY ACCURATE. WHat credentials are required to be PM? Harper was a computer guy at Imperial Oil before becoming an EA and then an MP. Is that appropriate credentialling? Trudeau has been an MP since 2008 — and before that was a French and Maths teacher. I don’t exactly get the difference. If you need to be lawyer to be PM then I guess Mulcair wins? NOt sure what the “no credentials” thing refers to. For those who are interested in strategic voting, here are the recommendations by Leadnow. Mostly NDP in BC, Liberal in Ontario. These recommendations make good sense for those of us whose #1 priority is a change in government and repairing the damage done by nine years of Mr Harper’s rule. I spend half my time down in the states and half the time in ontario canada. I watched the housing market in the states hit bottom in 2008 and yet the conservatives kept canada from going through this recession. In fact the rest of the world struggled and yet canadians whined how hard done we are. Houses in the states worth 425,000 went to 120,000 within weeks. people lost their homes and banks closed. Canada the house prices slowly went up. The last time liberals were in power in 1993 canadian house market fell to half the value and the same thing back in the early eighties with liberals in power. I think young trudeau does not have the experience to keep this from happening again. So if you voted liberal get ready for the house market to fall apart. Not only that but everytime they have been in power some sector suffered. This time it will be single moms losing child benefit amounts and also our seniors losing cpp amounts. Think before you vote. Saying he is going to legalize marijuana the same as the last time liberals were in charge and what happened? They were the ones who shut down the bill when everyone had voted for legalization because the american government stopped it. This will happen again. So do not vote on one issue vote on the over all welfare of canada and which party will keep us from hitting a recession. The housing market crashed in the states because conservatives there, with the help of misguided liberals, repealed the Glass-Steagal Act. Here in Canada, the banks were better regulated. Those regulations were put in by the Liberal governments. Canada’s relatively good showing in the Great Recession had little to do with Mr Harper. We can feel grateful we’d had previous Liberal governments that understood the need for oversight of banking. The Liberals have proposed raising CPP, not lowering it. The conservatives want to leave it the same. Legalizing marijuana is a minor issue, except to Conservatives who seem to like to get hysterical about it. Peace, order and good government. I remain unclear about what Harper’s Conservatives have done so bad to Canada. Might be a little off topic here but it was mentioned above so…However for all those who would like to vote because the Conservatives are to “cozy” with oil…you should remember that oil is one of the largest industries in our country (if not the biggest). It affects every part of our economy all across the country, shutting it down or putting punitive taxes on it will hurt jobs and people everywhere. To think otherwise is simply ill informed. As well for those who haven’t thought about it the oil industry you hate also supplies the clothes that you wear (it is either in most fabrics or at the very least carries it to you), the food you eat (from the massive tractors burning diesel to trucks bringing it to you) to your pharmaceutical’s and virtually every other aspect of your life in this modern world. The NDP would love to destroy this industry and the Liberals don’t really care as long as they are elected. Harper has steered us through 1 nasty recession and we are on our way out of another, not sure how this record is bad. Voting for “change” simply for the word seems odd to me, shouldn’t there be a purpose? Leadnow lost any sort of credibility (if it had any before) when it requested that voters vote for NDP in a riding where the Liberals are by far the strongest candidate. People should actually look at real polls/real life instead of trusting this trashy group. Which riding? They have recommended roughly the same number of Liberals as NDP, nothing but Liberals in Ontario. If you’re talking about Vancouver Granville, I’m puzzled by that too, and sent them an Email for clarification. but I think to say they “lost any sort of credibility” is a bit over the top. Leadnow has endorsed 13 Liberals and 10 NDP. I am for harper , I understand many are not . My thought is what about outside of Canada. Do you really want to tie little smiling Justin on a string and let the big Russian cat toy with him until he is ready to put him out of his misery. Comments like “I will tell him face to face when we meet”( Wow I bet he is shaking in his muscle shirt right now!!) sound like what they are Justin`s cheap talk. I must say it look`s pretty sad when you put it beside what our Prime Minister has been able to accomplish on the world stage without any help from a lame duck American leadership. Harper has Canada & Canadians punching way above our weight class and his work on the world stage has clearly moved us from being Uncle Sam`s little cousin to a legitimate player on the world stage. I ask you all who does Putin want to see elected in Canada. You can bet it`s not Harper! We will be doing him a great favor if we are foolish enough to stack Justin up with the current American leader. Let`s keep pushing forward on the world stage . It is not the right time to change . Putin is licking his chop`s just waiting for us to make this mistake and clear his biggest advisory out of the way for him. Harper is the voice of the western free would and is far more qualified to lead on the world stage. I would think your interpretation of Canada’s standing on the world stage is the opposite to what is widely reported in the media. And I don’t understand why people keep holding up Putin as the benchmark to measuring leadership. NO ONE has been able to stand up to Putin. He is playing an entirely different political game than anyone else. Harper saying ‘I guess I will shake your hand but get out of Ukraine…’ — what did that actually achieve? Absolutely zero. It is risable to think that ANY political leader has actually cowered Putin — and it is also largely meaningless to even consider it. I am for harper , I understand many are not . My thought is what about outside of Canada. Do you really want to take Prime Minister Harper off the world stage And replace him with Justin? Comments like “I will tell him face to face when we meet”( Wow I bet he is shaking in his muscle shirt right now!!) are nothing more than lip service. I must say it look`s pretty sad when you put it beside what our Prime Minister has been able to accomplish on the world stage without any help from American leadership. Harper has Canada & Canadians punching way above our weight class and his work on the world stage has clearly moved us from being Uncle Sam`s little cousin to a legitimate player on the world stage. I ask you all who does Putin want to see elected in Canada. You can bet it`s not Harper! We will be doing him a great favor if we are foolish enough to stack Justin up with the current American leader. Let`s keep pushing forward on the world stage . It is not the right time to change . Putin is licking his chop`s just waiting for us to make this mistake and clear his biggest advisory out of the way for him. Harper is the voice of the western free would and is far more qualified to lead on the world stage. This should be considered in your strategic voting. We are not in my view strong enough to strut around the world stage as “the voice of the western free world.” Mr Harper has taken unnecessarily rigid stands on everything from Iran to Israel and has burnt bridges in a way that prevents us from even talking to governments we don’t like. Thus the overlong imprisonment of Mr Fahmy, as he himself pointed out the other day. I’d rather have Mr Trudeau’s team in place, frankly. We don’t need John Wayne foreign policy; leave that to the US. And the idea that Mr Putin cares at all who the PM of Canada is, is a bit ridiculous, IMHO. Canada doesn’t matter to him in the slightest. Why do we need public polls at all? I can understand their value for party campaign planning but wonder why we need a poll to tell us how well a party is doing. Is it because we have to have the Blue Jay disease and become fans only when they are winning? We should have enough confidence in our own judgement to select a candidate without the “guidance” provided by pre-election polls. Then again most are so ill informed they vote for reasons other than the good of the country. I’m an immigrant. I voted for the conservatives 2 times in the past, but I really don’t like the way Mr Harper does his politics. Among all parties, he is the one who shows most hatred toward other parties, particularly the liberals. It’s not a civil war, it’s just an election. Trudeau brings hope. At least he’s the one I see that promotes the idea of a great country should be. 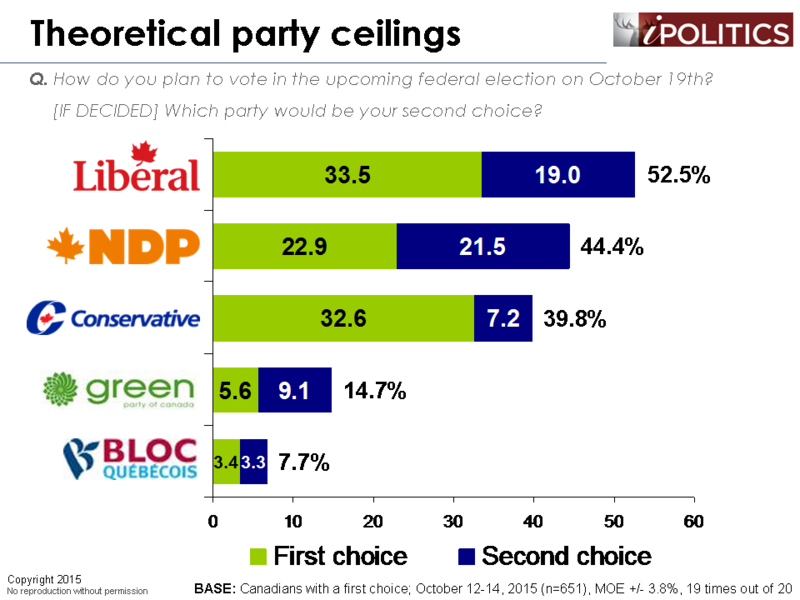 This poll is the only one to show this, the ekospolitics seems to only favor PC, while others favor Liberal or NDP. Most polls except this one however show the gap increasing not narrowing, looks like last minute attempt to sway the undecided vote. There is a poll that takes average of all which show a 5 to 7 percent or 35 seat difference in favor of the liberal party. Tories will win as I said a few weeks back. Voters are sceptical about Turdeau. Hell Id prefer Mulcair over Turdeau any day. I would urge NDP and Liberal voters to go for strategic voting. I am a NDP supported but I would go for Liberal because I am afraid Cons will win if our vote split. I understand that many NDP suporters would go with their heart and they have doubt about Liberal’s blurry vision and ‘gone with the wind’ policy but Trudeau by no means even close to the PM we have now. If both can form govt, I am sure NDP would be able to implement some of the key agendas. Having came from Bangladesh, I can’t really make any difference with Harper and Bangladesh’s evil politian’s mindset, the only difference is Harper and his gang can’t secretly get away of many things because of our strong civil society in Canada. Hey Don I think your talking about the 3 ring circus Canada use to be under previous liberal leadership . If you don’t think we pack more punch than ever before perhaps I am not the ridiculous one. As for thinking it doesn`t matter what Canadians think to others ,well maybe that’s the attitude that made us the weakling in the sandbox for so long . Harper is speaking Putin hears him and he is doing it on his own. Let`s put the Liberals in and see how long it takes Russia to decide to push into northern Canadian Territory. Right now John Wayne is a Russian and he won`t be backing down when Howdy Dowdy show`s up for a face to face. Really? Is that the new Conservative line of attack? “If you vote for the Liberals the Russians will invade the north?” C’mon. Canada used to be respected as a peace maker and international negotiator. The country was respected as an independent and fair mediator. Harper abrogating international treaties and rattling a tin foil sabre doesn’t achieve anything. I hate to point out the bleedin’ obvious but Canada IS the weakling in the sandbox. We have a tiny population and a tiny military. We don’t threaten anyone … least of all Putin. We are the shrimpy kid talking a big game because our big brother is standing behind us. That is how the world now sees us. Arguably, we were previously seen as the savvy and erudite respected peacemaker in the schoolyard. But maybe the metaphor is a bit overwrought. 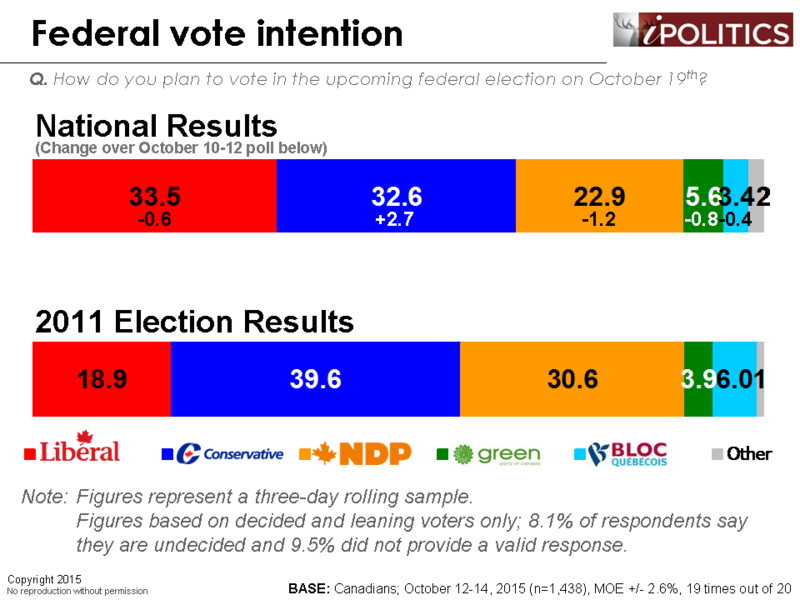 ALL other major polls including NANOS have the LIBS much further ahead of the CONS. I wonder why that is??? If 60% of Canadians want change. There was a record advance poll voting up from 2011 by 71% [3.6 MILLION]. There is also still a large undecided vote. The CONS better hope that most of the advance poll votes and the undecided votes will be for them or the CONS are done like dinner. I struggle to understand how a liberal vote is so informed as far as I can tell it`s just what all the cool kid`s are doing .If they have released a full platform it came very late in the campaign and the roll they have been on is all a social media event it does not have to seem or be right if everyone is doing it . It is a case of …I don`t want to be left out so I am a Liberal there is no more thought going into it than that. The same scenario as the riot in Vancouver …everyone is doing it so it can`t be bad!! Or the recent Alberta election. Now the running joke here is nobody knows anyone who voted in the NDP. That isn`t even bringing in all the idiotic comments Trudeau has made in the months leading up to this election. If those same comments had been made by Harper the left wing news papers would have never let up EVER ..Instead they bury it as fast as he spews it out. …. And hey Jay Z …it`s way more than just an election if the result is to take what hard working western Canadians (BC not included)have broken and busted there bodies for 14+ hrs a day 7 days a week only to have Robin Hood steal it to give it to the so called Poor …or is it lazy…Alberta has always welcomed other Canadians to come in and earn your own share . Heck East Coast folks can come in here for five years and make enough money to go back home and live a pretty good life for years, spend their hard earned money in their economy, then comeback and do it all over again and we love them for there work ethic. So when some smiling face say`s we will take from the rich to give to the poor it becomes a little uncivil. It is a case of the majority of people just want HARPER gone. It seems that some HARPER supporters are deaf , dumb and blind to all of the corruption in the HARPER government in the last 10 years. Some also seem blind to what HARPER has done to our democracy and Canada’s reputation around the world on man made climate change and our role in wars. During this election HARPER choose to make this the longest election in Canadian history and then he talks about wanting to save tax payers money? He has spent millions fighting VETS and First Nations Peoples , etc at the Supreme Court. He broke a Liberal record of spending the most tax payer money on partisan ads. He even had us pay for his own personal web site. Then in the height of hypocrisy he has ROB and DOUG FORD host his finally campaign rally. What happened to HARPER’s anti drug / tough on crime stance? HARPER ran a very negative campaign of division and fear. A campaign that the American Republicans might have run. We are in Canada and we have never seen a Canadian PM try the kind of stuff that HARPER has tried before. HARPER’S values are just not Canadian values. Your post seems to suggest that Albertans are the only hard working Canadians [as are those special Easterners] and that the rest of Canada owes ALBERTA a favour? So we should vote for HARPER? Alberta isn’t the whole of Western Canada. It is just 1 Canadian province. We are ALL Canadians and we are ALL not lazy. ALBERTA , is a very important Canadian Province however all Canadians pay taxes that support ALL of Canada , even Alberta. HARPER has proven to be a 1 man party who wants every thing to be his way or hit the high way. A lot of Canadians are just sick of it. A majority of voters dont want Turdeau. Whats your point? Conservatives are by far the best for the economy and if you don’t have a strong economy than nothing else matters because the government won’t have any money for health care,infrastructure,old age pensions or anything else.so it has to be number one. Trudeau knows less than nothing about economics and business, he would increase our debt which will cause higher taxes in the future and cutbacks in government spending and big drop in the loonie. Yeah Alberta is just one province , it`s the one the liberals always come after for the money to fund all the promises they make but can`t keep. It`s easy to like the guy who say`s yes to everything , I get that …it`s easy to hate the guy who says no . As for all the things you list that HARPER has done wrong over his 10 years I would sure like to see the pro`s and con`s list on any previous Liberal Prime Minister who served half that long. Of course your not interested in any Pro`s are you! All I really would like is some indication of how a Liberal or NDP government plan`s to pay for all the promises they are making . All the are doing is telling people what they want to hear without any clear plan on the economics of it. Who is paying for all this??? You hear talk of 15 dollar a day Child care …It`s 80.00 here …per chid in some cases… Of course there must be a plan in place for where the money comes from after you start taxing the richest 1% to give it to the poor?? You will need a plan because the richest 1% can afford to ply their trade from just about anywhere so they will be leaving as fast as they did when Justin`s Papa thought the National Energy Board would be a good idea… Most of those wealthy folk have never came back ! You might have to ask you parents to break that down for you but I was just into the work force then and I surely would not wish it on my kids . As for the crap about HARPER trying to separate the country …have you seen him riding a train through your province giving everyone the one finger salute ?? No you haven`t that was Justin`s papa again …So when we line up to pay for all the promises please feel free to see Alberta as just one of the provinces paying only our share . But don`t trick yourself into believing that`s all we will be giving. Big brother is not standing behind anyone they haven`t for 7 plus years . That`s my point ! As for our northern waters it`s a rich area some other countries covet it . Some of those countries play nice one doesn’t . One country`s leader believes they have an equal or greater right to it. I would suggest it has very little to do with military might it has everything to do with money . Russia need`s money and climate control isn`t a factor , and it is starting to look like right or wrong is not going to be a factor. But no worries Howdy dowdy will throw on his best superman pajama`s and go face to face with Putin. I suggest it takes a way bigger man to stand alone armed with that tinfoil sword and not much else and still hold his ground. I’m an immigrant myself. I salute what the Harper’s government has done with the new bill, and YES I support the revoking of someone’s citizenship status if this person is charged in relation to a terrorism act. Come on people waaaaaake uppp look at what Europe is going through , France ( 3 incidences of terrorism in a very short span ) protests in England by fundamentalists wanting The government to rule by Shariaa law =ISIS laws, German, Austrian, …. you don’t want those people to hold a citizenship status and live next door to you, believe me I have been there. the real believes of those that if you are not Muslim following them you are their enemy and should be killed. I hope everyone thinks more before they decide on who they will support not because you want a change then you give the government to a young guy that dropped out of college and relied on his father’s name in becoming a politician ! I LOVE Liberal ideology. Just look at what the Ontario Liberals are doing. They no sooner declare a $120Billion spending spree and selloff of Hydro and the Hydro rates go up. Who is going to repay this debt? I’m about to retire, it’s YOU, the younger generation who will pay with increased taxes over the next 20-30yrs. Good luck with that. Trudeau is the ONLY candidate saying a deficit is good. Heck, even the US presidential candidates are smart enough not to say that. But let’s not pick on the present Premier, let’s go back to the one before her. McGuinty Ontario Health Premium – The highest tax increase in Ontario’s history, implemented months after Dalton McGuinty was elected in 2003 on a promise to not increase taxes (even after signing a contract with the Canadian Taxpayers Federation to not increase taxes). Yep, I trust the Liberals with my money… And Trudeau’s man being caught with his alliance to big oil?